Legend has it that there has been an inn situated here since 1854. While the actual building we know today is not as old, there could certainly have been on this site a “Notties” inn or a tavern for the soldiers stationed at Fort Nottingham, who were supposed to protect the area from bushmen who were stealing local livestock. Situated at the crossroads where the road to the interior met the road to Fort Nottingham, it would have served the horse-drawn coaches that travelled the area before the railway line was constructed. The first recorded facts about the hotel we know today indicate that the land for the Notties Hotel was bought by George Orwin in 1889, following the death of landowner James Ellis and his sister Janet King, the land being sold by the family to pay off the siblings’ estates. The price received for the land, the princely sum of 125 pounds per acre, was extremely high for the time. Presumably it was the favourable location that drove the price so high. Orwin erected the Railway Hotel, as it was first named, to serve the station that was built at the tiny Nottingham Road settlement. Local farmer and settler Charles Smythe writes in his diary, “July 12th, 1882: The railway has at last commenced, and there is a large staff of men on Gowrie busy putting up buildings and beginning the earthworks. The station is to be just at the crossing of the road to Fort Nottingham, about two miles from Strathearn.” The railway line finally reached Nottingham Road at the end of 1885. The station was initially called Harrison’s Camp after the contractor (prior to the station’s opening), before being called Karkloof Station. However, the name was changed to Nottingham Road Station in 1887, as the locals decided that it was too far from Karkloof to be so named. Previously, Lidgetton was the last stop. The railway changed the lives of the Midlands’ settlers forever. There was a daily postal system, and almost anything they needed could now be ordered from Durban or Pietermaritzburg. Produce from the area could be quickly sent to the city centres for sale, and travel between the coast and the interior was a matter of hours rather than weeks or days. The railway also led to the development of the Midlands as a viable area for settlement. The so-called Railway Hotel, built by a Mr C Morgan, was completed at the beginning of 1891, and soon became the centre of social activity at Nottingham Road. A gracious, two-storey building set in rolling lawns, the hotel offered guests the comforts of proper lighting (using acetylene gas), tennis courts and a billiards room, as well as activities such as shooting and horse riding. At the turn of the century, the Singleton family took over the running of the hotel. The Nottingham Road Hotel was always the locals’ favourite haunt, whether for a social drink in the pub or for supposedly more serious matters such as meetings of the Nottingham Road Farmers’ Association. Apparently the farmers often only arrived home safely because their faithful horses knew the way back to their stables! The system worked smoothly until a prankster swopped the horses between the different traps and carts, so that drink-befuddled farmers were taken off in completely the wrong direction! Often the locals would decide to stay over at the hotel, especially if the weather was bad. One farmer, Christopher Groom, trying to reach the hotel to shelter from a storm, was unable to reach the hotel in time and was struck by a bolt of lightning just outside (where the first tennis courts were located). He and his dead horse were discovered some time later when the storm had passed over, the unconscious man quite unaware of his narrow escape. A hole straight through his saddle showed where the bolt of lightning had struck. Like all hotels with a history, Notties Hotel is reputed to be haunted. In the past, guests and staff have reported that the spirit of a woman roams the hotel (especially room 10) and its grounds. This house-proud, gentle ghost apparently moves flower arrangements, tidies away clothes and straightens bedding. Legend has it that she is ‘Charlotte’, a lady of loose morals or a chamber maid depending on the source of the tale, who apparently threw herself to her death down the hotel staircase after being jilted. Or was she pushed? Today, “Notties” is one of the Midlands’ most popular hotels. Its dark and cosy wood-panelled pub, with roaring log fires on colder nights, offers tasty pub fare and beer on tap, while the more elegant dining-room doubles as a functions-room. The bedrooms are comfortable and a spacious garden offers a relaxed place to while away a sunny Midlands’ afternoon. Whatever its age, Notties Hotel is one of the area’s most popular landmarks, with a colourful history of more than a century of pleasing the crowds. Little has been recorded of the exact history of Nottingham Road itself. Snippets of information heare taken from “The Road to Fort Nottingham”, written by Robert King, as well as stories passed through from generation to generation. Nottingham Road was named after the Nottinghamshire Regiment stationed in the area in 1856 during the building of Fort Nottingham. 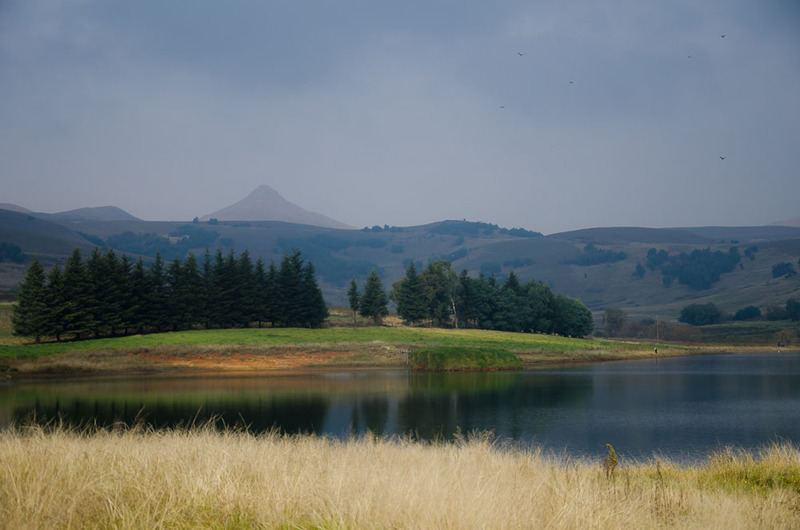 The Boers were believed to have settled here in the early 1800′s but besides small farm dwellings, there was no formal settlement and the ‘village’ did not exist. Upon the British annexation of Natal in 1849, several immigration schemes were put in place to encourage British settlement in the province. One such scheme was the Bryne Immigration scheme. Each family paid 10 pounds and this included the passage from Scotland and a small plot of land (believed to be 20 acres). One of the first Scottish families to arrive were the King family, who, after residing in Pietermaritzburg for 6 months, arrived on Wilde Als Spruit farm in May 1850 (today known as Lynedoch). Here they spent the first 3 months of harsh winter conditions under a tarpaulin to protect them. The women and children were excellent horsemen, using them to plough the fields, visit neighbours or collect supplies from the nearest town – Pietermaritzburg. Local grass was used to build roofs of homes and many farmers made their own bricks if the local stone did not suffice. Because of the great distance to Pietermaritzburg, many homes took years to complete. The kitchens were the focal point of the home with bedrooms being added on when more children arrived in the family. The women were responsible for looking after the children, churning the cheese, baking the home-made bread and educating children. On 1st April 1884 a picnic for about 30 people was held on Lynedoch to celebrate the coming of the first railway engine onto the farm. The site then reached the Nottingham Road Station by the end of 1885. Before the station was opened it was known as Harrison’s Camp after the contractor. 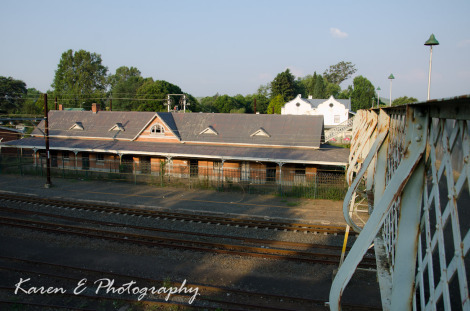 The station was known for some years as Karkloof Station but it was decided that it was too far away from Karkloof, nor was it ever used by the Karkloof people so the name changed to Nottingham Road Station (on the road to Fort Nottingham) late in 1887. Although the name is not very original, it is the only telegraphic address of its name in the world. The arrival of the railway was also the first step towards developing Nottingham Road as a rural centre.